Help, My Cat is Driving Me Crazy! Pam, it would appear that Buddy is bored and he's asking for help. Right now, he's training you, not the other way around. Buddy clearly needs more stimulation in his life. While another cat friend would certainly help, there are things you can do to help Buddy. We should warn you, though - some of these things are concessions on your part. With cats, we often have to give up certain things in our lives that don't quite jive with the life of a cat. Our first suggestion is for you to stop reacting to the things Buddy does to get your attention. When you react, you show him that his method is working. Smart cats like Buddy know what buttons to push in order to get what they want. If you allow him to continue to succeed, you're just reinforcing the behaviors you dislike. If you ignore his antics, they will eventually stop. Yes, he'll probably try something else, but you have to be strong and not react. Second, you need to start Buddy on a daily schedule. It will help him to be able to anticipate what's coming next in his day. Feedings should only ever be at particular times of day. Play times should be once in the morning and once in the evening for at least 30 minutes. His bedtime should be consistent and should happen right after he has his evening play time and feeding time. The natural rhythm of a cat's life is hunt, eat, sleep. You can take advantage of this by playing (hunting), then feeding him, then crashing with him. Use consistent words or phrases like "time for play" "time for food" and "time for sleep" every time so he learns to anticipate the order of things. He'll probably continue to ask to eat or play early, but if you're firm with him and only do so when it's time, he'll soon learn and be comforted by the routine. We like to use the phrase "not time yet" when food time is anticipated and requested by a cat. Play time is an important part of this for an intelligent cat like Buddy. He needs activity and stimulation in his day. If his current toys don't stimulate him to chase as much as you'd like, try something else. I've had tremendous success with "Da Bird", but there's a bit of trial and error in finding out what kind of play each cat reacts to. The laser toy is okay, but only if he's given a food reward when he "catches" the dot. Otherwise it can be highly frustrating because there's nothing to catch and satisfy his hunting instincts. Once you get his play routine down, a smart cat like Buddy will usually respond well to clicker training and may even adapt to wearing a harness for outdoor adventures, but let's get him settled down a bit first. It will also help Buddy if he has some vertical space, especially near a window. A tall cat tree beside a window that faces animal or human activity, even if it's traffic, will give Buddy something to focus on when you're away. Environmental enrichment and novelty may help as well. That's just a fancy way of saying put some boxes around for him to explore. Add some holes and use the boxes during your play times with Buddy. Rearrange or replace the boxes fairly frequently. Every time you receive a delivery, think of the box as an added bonus - a toy for Buddy. Cats need new areas to be curious about and investigate. Outside, this is easy because the world is always changing. Indoors, you need to help provide him with that stimulus. We'd also suggest involving Buddy in the things you do day in and day out. When you come home, offer to let him smell your hands so he can see where you've been. Scents are like stories to cats and they can be very entertaining. When you pick up something at the store, offer to let Buddy investigate it before you put it away. These little moments will add up to seriously enrich Buddy's world. We hope that these suggestions help and give you even more to think about. Try to see the world from Buddy's point of view and it's very likely that you can get along quite well with your feline roomie! Help! My Cat Runs Outside Every Time I open the Door! Dan, door darters like Oscar can really be worrisome as we all know what can happen to them out there in the world of mean people, predators, and traffic. Some people simply try to distract their cat when the door is opened, or put them in another room. We feel very strongly that it's possible to train a cat to observe this boundary through positive reinforcement. Of course, it will be much clearer to Oscar if he's never allowed outside at all. It'll be much easier for him to understand consistent rules that everyone in the household enforces. It's important to understand why Oscar might want to run outside. Many indoor cats are bored with their surroundings and see a lot of cool stuff happening on the other side of the window. You can help by making Oscar's indoor environment more interesting. This doesn't have to be expensive. If you get a package in the mail, cut the box flaps off and share the box with Oscar. When you come home with groceries, leave a paper bag out for Oscar to sniff and explore. Take every opportunity to add temporary playthings to Oscar's world. Smells are like stories to cats and bringing in interesting scents from the outside world can be highly stimulating. The next step is to make the doorway less attractive to Oscar. Please note that cats do not respond well to negative reinforcement, so punishing Oscar in any way will only communicate to him that he was right to try and get away from you and your home. Instead, you want to get a good supply of his favorite treats ready. You're going to need them. 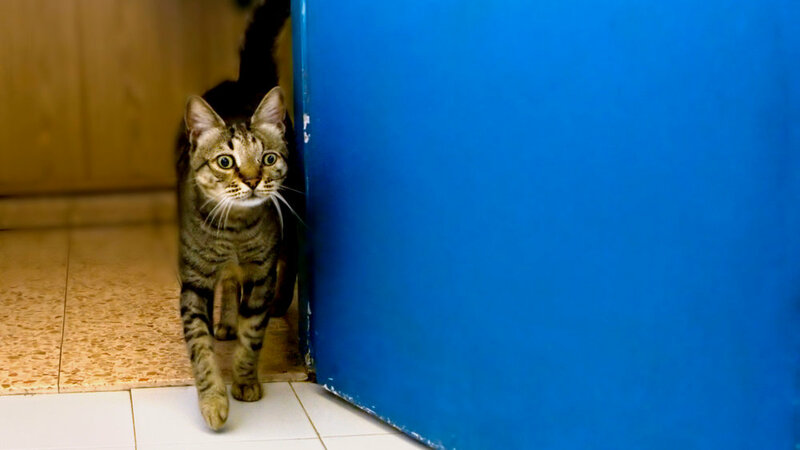 A lot of cats rush to the doorway when their humans leave or come home because they receive generous amounts of attention then. We want to change that by moving the area where Oscar gets greeted and given his farewells. We want him to associate positive things with that new spot in place of the doorway. It can be a bed, a cat tree, a mat on the floor, or any clearly defined area. Begin by calling Oscar over to the spot where you'd like him to be. When he gets there, offer him a treat and pet him. Once he's wandered away again, call him back and reward him again. Do this a few times each day until he eagerly runs to the spot you've chosen when you call him there. You can even give the spot a special name so he'll understand what you want. If he isn't interested, let it go for the time being and try again later. You want this to be a fun interaction for Oscar, not a forced training session. Now, repeat this behavior each time you leave the house and each time you come home. Oscar should soon learn that being in the right place at the right time earns him attention. It also shows him that when the door opens, being at the door earns him nothing but a set of grabby hands intent on keeping him inside. If his behavior persists (some cats can be very stubborn about this), a deterrent can be used. Our preference is for a citrus sachet made of fresh orange peels in a mesh bag that can be hung from the doorknob. One whiff of that should have Oscar recoiling from the door without blaming any humans for the offense. Good luck, Dan. We wish you and Oscar all the best! Deborah, it can sometimes be difficult to find a scratcher material that certain cats are attracted to. Usually, the rougher the material, the better. In the wild, most cats use trees for this activity and they like trees with heavy, convoluted bark. We've had the best luck with sisal scratchers, but cats can sometimes become fixated on very particular materials. We had an experience with one cat who would ignore every scratcher in favor of anything made of leather because that was what she'd first experienced in her original caregiver's home. Our advice is to think outside the box. Bring in a piece of firewood with heavy bark. You might even nail it to a wooden base. There are wooden cat posts, of course, but until you find the material that Lucy responds to, why waste your money? Try berber carpet scraps wrapped around the wood if the wood alone doesn't work. Unfortunately, it's a bit of trial and error, but often the commercially available scratcher materials don't trigger the cat's scratching instinct. You can also use the scratcher to scratch your own nails when Lucy is around. Ham it up and show her how good it feels. She may look at you like you've lost your mind but she may also copy your actions. Yes, it might feel silly, but some cats learn best by example. We've all heard the term "copycat", right? Be sure to keep Lucy's nails trimmed. If she isn't using a scratching post, this can be even more important than it normally would be. Scratching serves several purposes for cats, including shedding old nail sheaths to reveal new, razor-sharp claws underneath. You've probably seen the cast-off nails around your house. As to the catnip, it's not uncommon for cats to ignore it. An estimated 30-50% of all felines lack the gene for the positive response to catnip. If Lucy doesn't care for it, that's okay. You can have her favorite treats on hand to reward her every time she approaches or sniffs her scratcher. Positive reinforcement works as long as you're consistent with it. We hope these tips help, Deborah. All our best wishes to you and Lucy! 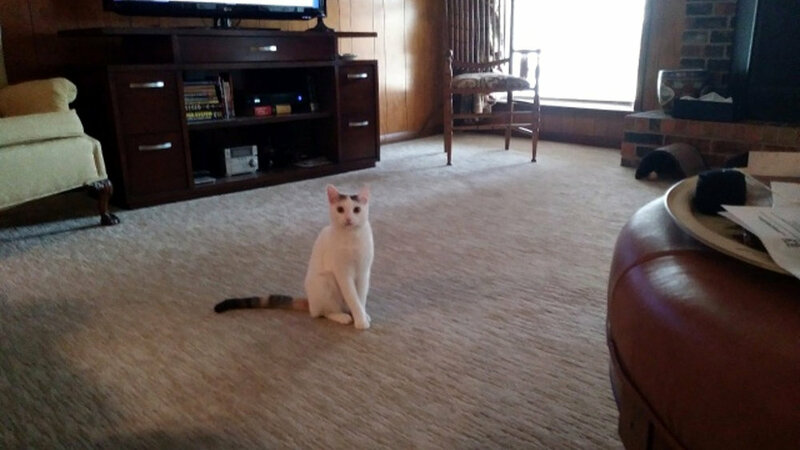 I have an eight month old neutered male cat I adopted from a local rescue about a month ago. He was bottle raised with his siblings after his mother passed a few days after having her litter. The rescue explained that he could have some behavioral issues because he didn’t have a kitty momma to wean him properly or teach him manners. He likes to snuggle up to my face while I’m sleeping and then he chews on my chin or nose. He also does this when I’m awake and petting him. There is zero aggression behind these bites. His body is relaxed, purring, ears forward, etc. I’ve tried to discourage this by gently pushing him away. When he bites I make a loud “ow!” noise and move away, stop petting, cuddling. But it hasn’t abated in the least, instead he seems more determined to get in my face and get a nibble. Kate, teaching a motherless cat manners can be a long process. Mother cats basically bop their babies with their paw when they do things like this, which is fine if you're a cat, but when you're a gigantic, all-powerful human, any kind of hitting can induce fear. Cats should never be struck in any way. Even playful strikes will either convey aggression or an invitation to play rough. Everything you were told is spot on. The only thing I would offer is to stop pushing him away. This is a sign to Rigatoni that you're inviting rough play. The only responses you can have are to indicate your distress (the higher the pitch of your "hurt" sound the better) and walk away. Leaving him alone in the room is the best option, though I realize this presents a problem when you're in bed. Still, these are things than can be reinforced throughout the day. You have to look for the warning signs of aggressive play and redirect it at all times. Every slip up when you or a family member think he's being cute, is a step backwards in his training. When you see him "stalking" your feet or sneaking up on you, simply redirect the behavior with a toy he likes. In addition, I encourage you not to ever use your hands or feet as a toy for Rigatoni. Always direct him toward a toy that he can eagerly sink his teeth and claws into without hurting anyone. One other thing that might help is the development of a bedtime routine. If you want to go to bed at 11PM, have a vigorous play session with Rigatoni and his favorite games around 10PM each night. Really get him going and let him exercise his hunting instincts. When he's done playing, feed him his evening meal. Then it's time for bed and Rigatoni should crash out. He may get up again during the night, but the more you repeat this schedule, the better he'll be at following it. Wishing you and Rigatoni all the best!